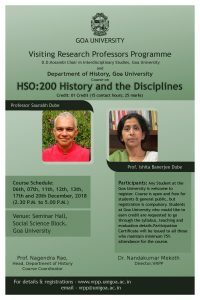 Goa University has launched the Visiting Research Professors Programme that will bring doyens in the fields of liberal arts, social and natural sciences, and other fields to the University. 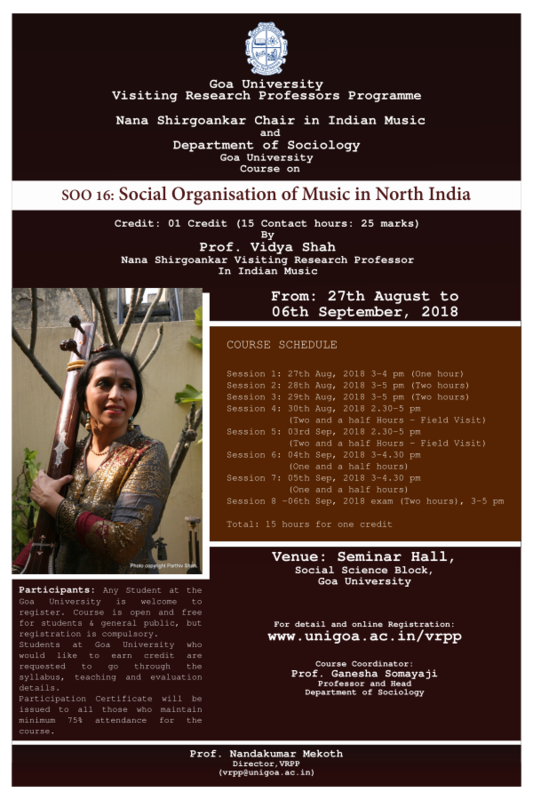 The visiting professors will interact with students, deliver lectures, offer courses, and work on collaborative research projects, or stimulate the creation of art installations and music performances with faculty and students. 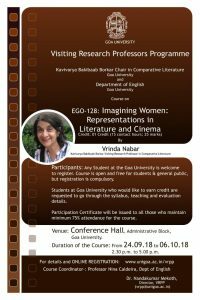 It is hoped that while blurring boundaries between traditional disciplines, the visiting professors will generate a creative environment in learning and contemporary knowledge production practices with their intellectual and aesthetic endeavors. 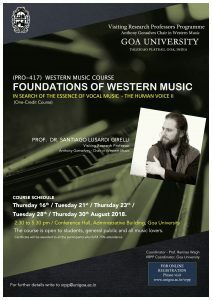 The programme is being supported by the Department of Art and Culture, Government of Goa. 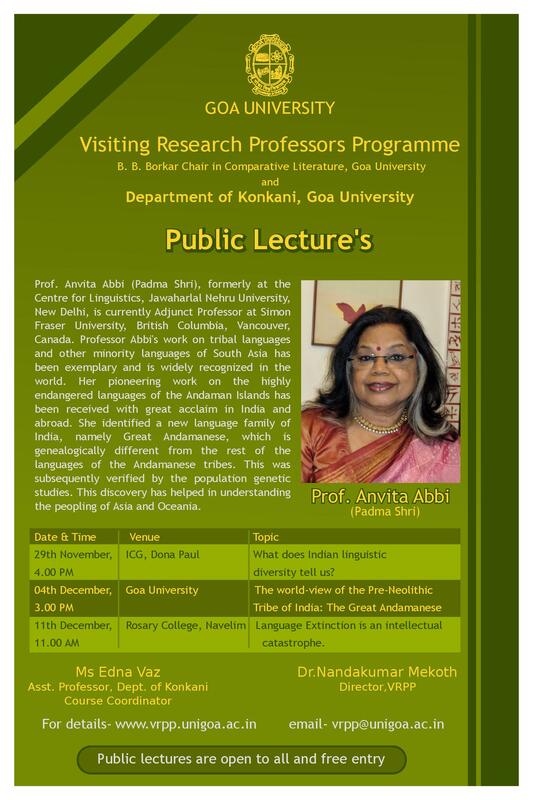 The first of the visiting professor chairs was mooted by the Department in the name of Goan polymath Prof. D.D. Kosambi during his birth centenary year, 2007. 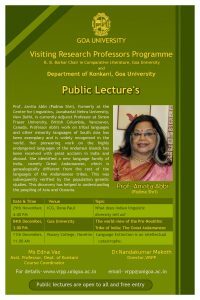 This was followed by the institution of professorships named after the well known Goan poet B.B. Borkar, and the first Chief Minister of Goa Shri Dayanand Bandodkar during their birth centenary years in 2010 and 2011, respectively. 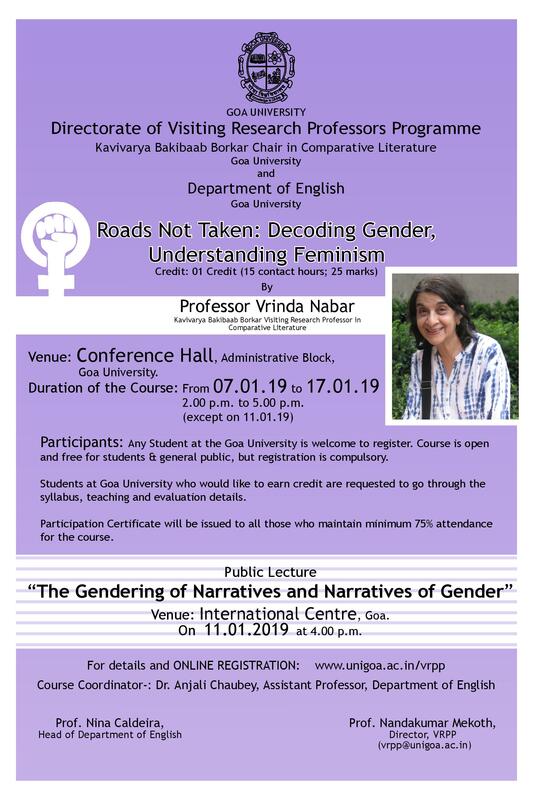 In 2012 the Department instituted three more chairs in the names of three eminent Goans, Shri Mario Miranda, Shri Anthony Gonsalves, and Shri Nana Shirgaokar. 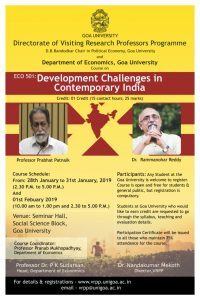 The original idea behind instituting of the professorships was to attract academics around the country to serve as full-time professors at the campus of Goa University. It turned out, however, that well-established academics were reluctant to relocate to Goa. 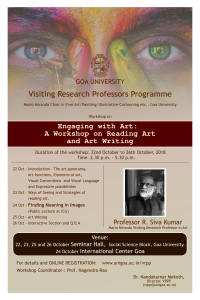 The Executive Council of Goa University, in consultation with Department of Art & Culture, then decided to initiate the Visiting Research Professorship Programme under which an academic would spend approximately six to twelve weeks at Goa University every year for about three years. This format has received good support from respected academics from around the country. The Executive Council oversees this programme through its recently created Standing Committee on Visiting Research Professorship Programme. 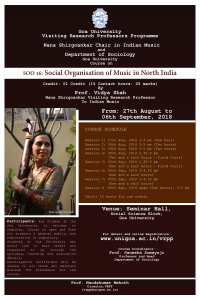 The committee is chaired by Dr. Maria Couto and has Shri. 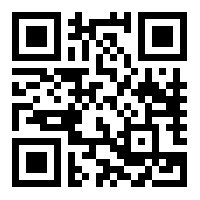 Ramachandra B. (Dinar) Bhatkar, Prof. Y.V.B. Reddy, Shri. P.F.X. de Lima, and Shri. Ranjit Hoskote as members. The committee works in close collaboration with Shri. Prasad Lolayekar, Director, Art & Culture. The committee has benefited from advice from Prof. Govardhan Mehta in the formulation of the programme. The activities that are being planned under the programme have emerged because of the foresight, generous support, and flexibility provided by Government of Goa, through its Department of Art & Culture. It is hoped that besides students and faculty of the university and colleges in Goa, the programme will allow public at large to interact with the visiting professors by attending their courses, lectures, performances, etc. 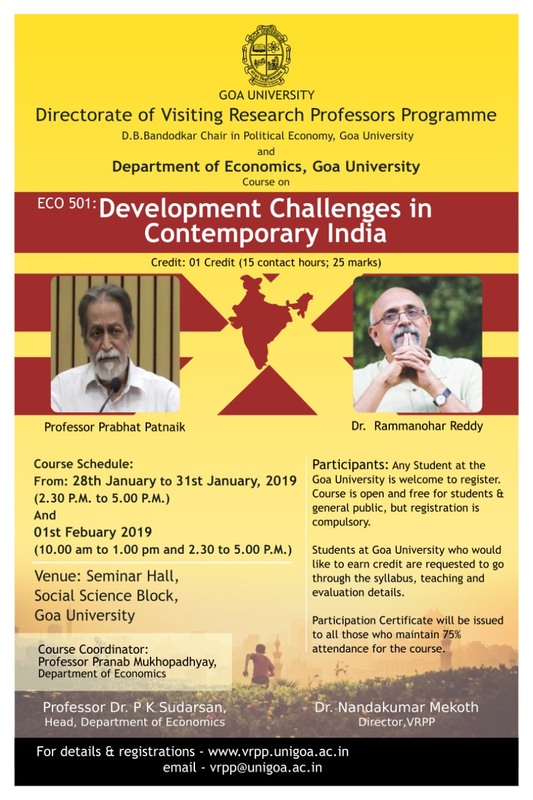 The Goa University is eager to seek the participation of the people of Goa in the activities, courses, events, and functions generated by these visiting professors. 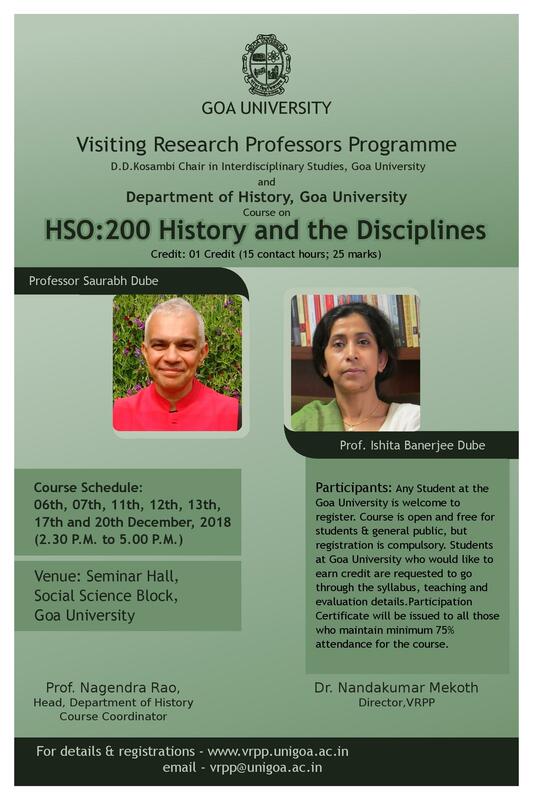 Over the next three years, the Goa University will explore the integration of the activities of the Visiting Professors with the curricula in its choice-based credit system.